The story of Shia LaBeouf, Nastja Säde Rönkkö, and Luke Turner’s “He Will Not Divide Us” art project has taken another, weirdly summer camp-y turn. The project—which initially consisted of a webcam streaming from outside a museum in New York, where people were encouraged to say “He Will Not Divide Us” for the benefit of online watchers—quickly became a lightning rod for the bored, attention-seeking impulses of the faux-but-not-really racists who’ve labeled themselves the “alt right.” Bombarding the project with weird poses, shouted anti-Semitism, and a lot of chugged milk, the group basically drove LaBeouf’s protest project out of New York, forcing it to reestablish itself in New Mexico. But even then, the twin lures of an open camera and the chance to nebulously “stick it” to Shia LaBeouf were too powerful, and the project was forced to move again. This time, LaBeouf and company attempted to buy their exercise in public awareness a little anonymity, setting up a “He Will Not Divide Us” flag in an “unknown location” and leaving it to film. But of course, nothing is truly ”unknown” on the internet; not the depths and lengths that trolls will go to in order to amuse themselves with their “edgy” attempts to troll a college freshman-level art project, and definitely not a camera left pointing at a sky that sometimes has planes flying across it. In a display of incredibly depressing enthusiasm and mis-applied industriousness, it took the denizens of 4chan—and those of its even-less reputable brethren like 8chan—roughly a day to use flight-plan data to narrow down the city where LaBeouf had hidden his camera. At which point, they started driving around Greenville, Tennessee, honking car horns and listening to their echo on the stream, in order to pinpoint the house where the flag was flying. Then, they stole it and replaced it with a picture of Pepe, thus transforming this whole thing into the world’s most infuriatingly elaborate game of capture the flag. 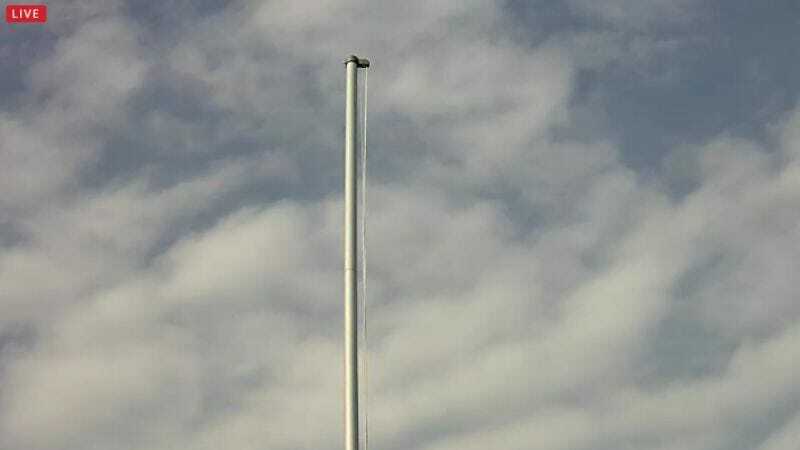 Said flag has since been taken down, and the webstream continues to run on an empty flagpole. There’s no word on where LaBeouf might move it next, or how online racists next plan to waste their lives in order to bring someone passively disagreeing with them down.